Issue 101 is now available! This issue includes poetry, prose, and art from new and frequent River Styx contributors. Issue 101 includes poetry contest winners Andrew Hemmert, Michael Dhyne, and Skyler LaLone in addition to poetry by Idris Anderson, Walter Bargen, Marianne Boruch, Oliver de la Paz, Teresa Dzieglewicz, James Kimbrell, Ted Kooser, Christopher Miles, Joan Murray, Bibhu Padhi, Martha Silano, Jason Sommer, Robert Stewart, Heather Treseler, and Christopher Warner. Poetry by Washington Benavides, and Claudia Magliano translated by Jesse Lee Kercheval. Fiction by David Driscoll, Kristine Ong Muslim, Mary Troy, and Erika Wurth, and an essay by Rashaun Allen. Order a copy or renew your subscription. You can also pick up issues at our upcoming readings. This centennial issue includes poetry, prose, and art from new and frequent River Styx contributors. Issue 100 has the winners of the Microfiction Contest, Tamara L. Panici, Mark Wagenaar and Leonora Desar. Poetry in the issue features Kerry James Evans, James A. H. White, Jeanne Emmons, Ena Djordjevic, Rebecca Baggett, Tara Betts, David Starkey, Sandy Longhorn, Jesse Lee Kercheval, William Trowbridge, Allison Joseph, Charles Harper Webb, Jeffrey Thomson, Jack B. Bedell, and Daniel Tobin. Poetry in translation is from Francesca Bell and Amy Newman. For fiction, prose comes from writers Anna Deen and David James Poissant, and an essay by Alex Myers. 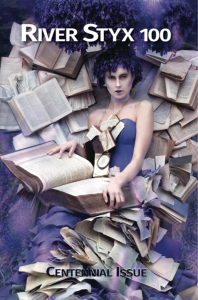 The cover art is by Kirsty Mitchell, and the inside art is a series “Testament” by Jennifer B. Thoreson. Issue 99 was released Winter 2017! This spectacular issue includes poetry, prose, and art on topics such as Japanese poets, gender identity, anthropology, love and loss, and much more! Issue 99 has the winners of the International Poetry Contest, Bruce Bond, Charles Tisdale, Leslie Williams, among many others. 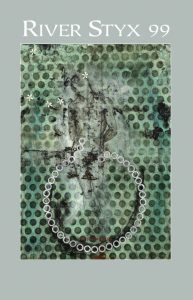 Poetry in the issue features Sandra Marchetti, G. J. Sanford, Danielle DeTiberus, and David Shaddock. For prose, fiction comes from Phong Nguyen, Blair Hurley, and Ryan Choi and an essay by Alex Myers. The cover art is by Tim Liddy, and the inside art is a collection “NewCollage” by Basil Kincaid. For the entire list contributors, please see the Table of Contents on our Archives Page. Issue 98 was released Summer 2017 and is still available! You won’t want to miss out on this issue full of moving poetry about fathers, Nadia Comaneci, disappointment, and more. There’s poetry by D.M. Aderibigbe, Asnia Asim, John Murillo, Roy Mash, Rusty Morrison, and Melissa Stein, but take a peek at the table of contents for Issue 98 to see the entire list of contributors. Explore the sexual tension in “Truck Manifesto” by Janelle Bassett and familial tension in “Pond Robber” by Woody Skinner, read about men and squirrels and dogs in the essays from Benjamin Busch, then enjoy the first-ever graphic story to be in an issue of River Styx! 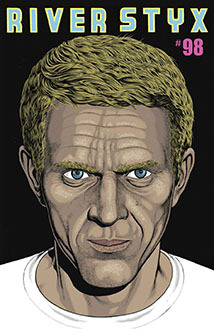 Tim Lane’s “Steve McQueen Has Vanished” follows the legend after he mysteriously vanished from the public eye and presents the story with hypnotizing art. In this issue, you’ll also find stories about women, snakes, and music lessons by the winners of the 2017 Micro-Fiction Contest.